According to a new study released yesterday from the Journal of the American Medical Association, adults with high levels of BPA in their bodies may be at a higher risk for developing heart disease, diabetes, and liver problems. However, the FDA says “products containing BPA currently on the market are safe and that exposure levels . . . are below those that may cause health effects.” You can read the story here. It may not be something we need to worry about but it is a good idea to make health risk preventable decisions. So for you next promotion consider giving Eco-Friendly BPA Free Sport Bottles. Your clients will appreciate your awareness. They can safely use these bottles day to day and be reminded of your company, your awareness of health issues and your concern for the environment. 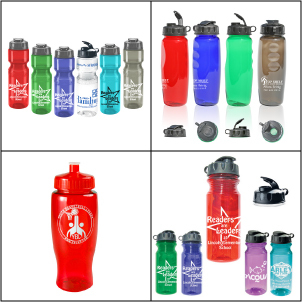 The 28 oz Eco – Fresh Lite Sports Bottle, Eco Fresh Grip Bottle, Poly-Pure Travel Bottle, and Eco-Fresh Lite Sports Bottle 21 oz are featured in the image above starting from the top left.